All you need is a jar, screen and seeds! First choose your seeds you’d like to sprout. 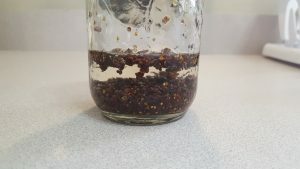 Pour the seeds into a jar, enough to cover about 1/4 of the base of your jar. Once they sprout , they’ll fill up the entire jar, so don’t over fill. If it’s not enough for your flock, add a second jar rather than overcrowd the one. 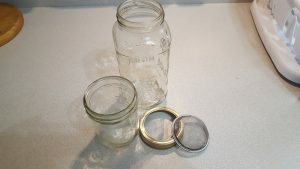 Now fill the jar/s with water—just enough to cover your seed—place a screen or cheese cloth over the mouth of the jar, and screw on the lid ring. Set aside for at least 12 hours, but no more then 24. Set aside until tomorrow. Anywhere on your counter is just fine. They don’t need sunlight. Each morning refill your jar with water, swish it around to moisten, and then dump the water out immediately. You only want to keep your seeds slightly damp from now on. Do this step daily until your seeds have sprouted. When they get their first tiny green leaves—about a day or 2 after you see the root emerge—ta-da! You have just learned how to sprout seeds for chickens!). Depending on the seeds you’re sprouting, this will take approximately 7-10 days in total. Soak your seeds no more then 24 hours to get them started. 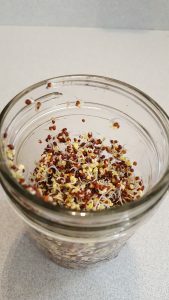 I personally sprout seeds for chickens in my flock in a couple different jars a week, each a few days apart so we have a fresh jar of sprouts to give the birds regularly. We also switch up the seeds we do so they have a yummy new treat each time. 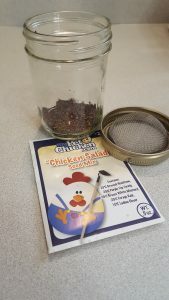 The My Pet Chicken Salad seed packets are my favorite because they are non-GMO mixed seeds from common plants chickens love. AND I can get 2 jars of sprouts per pack! Seeds have sprouted and will be ready to feed to the chickens tomorrow! 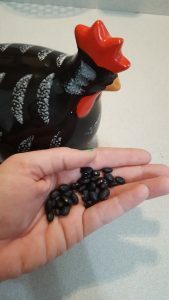 Do you sprout seeds for your chickens? Or do you have a different special treat you make for your chickens to help them get through the long cold days of winter?